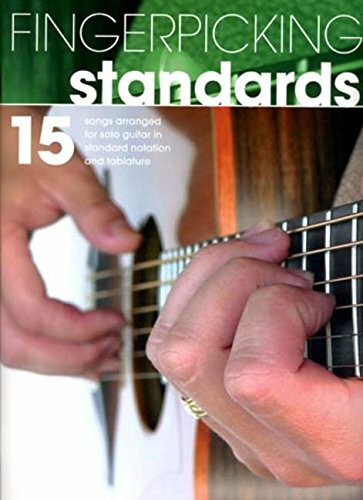 Fifteen standards specially arranged for intermediate-level guitarists. Each solo combines melody and harmony in one superb arrangement, and includes an easy introduction to basic fingerstyle guitar. All songs are arranged in both standard notation and tablature. Here, each solo combines melody and harmony in one superb arrangement. This work includes an easy introduction to basic fingerstyle guitar. All songs are arranged for solo guitar in standard notation and tablature. The songs include: "Can't Help Falling In Love"; "Crazy"; "Fly Me To The Moon"; "Georgia On My Mind"; "I Could Write A Book"; "Love Me Tender"; "Misty"; "Moon River"; "My Favourite Things"; "Unchained Melody"; "What A Wonderful World"; "When I Fall In Love"; and, "Yesterday".